As I dig further into the development of the story, keeping the time-space continuum intact is getting tricky. The plot contains many twists and simultaneous or overlapping forces that come up against the hero’s efforts. Each of these forces, which include different characters or events, has its own timelines, so to speak—things that must happen before and things that must happen after—for each to make sense. Even if the before or after moment isn’t necessary to show in the movie, I still need to at least reveal that they happened. We must meet the Judas character and trust him as much as Joe trusts him. We need to see that Joe knows he has a leak in the force: that someone close to him must be informing to the criminals, thwarting their efforts to bust the cartels. We need to see subtle hints that Joe is beginning to question this squad member, but we must not be able to figure this out before Joe figures it out. Joe must establish the importance of loyalty to his team, so we understand the consequences of disloyalty when it’s discovered. We must see the status quo of loyalty in the way the squad operates, so we can empathize with Joe and the squad when the busted Judas is ousted. Joe needs to test his suspicions against this officer. The Judas officer needs to fail the test, revealing his guilt to Joe. All of that must first happen before the first big moment I mentioned, where Joe confronts the officer. Also, for the officer to become bitter enough to testify falsely against Joe later, the moment must be sufficiently degrading; i.e., in front of the squad and with Joe’s wrath against this traitor at its worst. And the other officers need to be in the right place at the right time throughout these preceding moments, so we’re “with them” emotionally at this moment. And, while these things are happening, the story is still traveling forward, including what Joe’s older brother, the primary antagonist, is doing, and how the press is responding to the major events that Joe is creating, and how the crooked politicians are affect by and reacting to all this. Today, I began to map out the steps of the story outline chronologically, representing the major steps on a timeline. More than just putting the steps in order, it’s putting all the story threads on a calendar: a time breakout. What it will reveal: How many hours or days have transpired from this moment to the next and the next, and what other parallel events are happening, or need to happen? I’m envisioning that it will a kind of Gannt chart, maybe even using Microsoft Project to do it, so I can change the view to a standard calendar format, and back, with ease. Not sure yet. But I’ll let you know how it goes. The Princess Bride Screenplay—A Good Read? I just finished reading the screenplay for the movie The Princess Bride by William Goldman, and it was, in my opinion, a page turner. I was spellbound, unable to put it down. 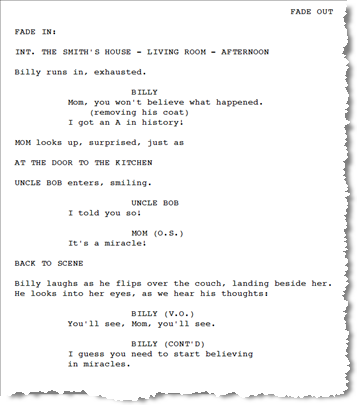 By nature, a screenplay is effectively a blueprint—a kind of instruction manual for assembling a movie. By nature, it isn’t written for the enjoyment of the consumer. So it’s unnatural when reading a screenplay feels natural: pleasurable. But isn’t a screenplay meant to tell a story too? Yes, of course. But, in a screenplay, that conveyance of the story is stilted—structured in a way that it is inevitably non-narrative: not easily read with the familiar, graceful sentence-to-sentence and paragraph-to-paragraph flow of the standard narrative form, such as you would expect in a short story or novel. So it’s a strain to the reader’s mind to consistently entertain and maintain the flow of the story as it hopscotches its way through the tangled form of the screenplay. That’s a great thing for me to remember as I approach the transition from constructing the step outline to writing the screenplay, as I now am. While it’s important to follow the industry-standard constructs of the screenplay format—to not do so could be a distraction to the reader—doing so doesn’t prevent the writer from making the process of the reading more enjoyable for the executive than the guh-zillion others they’re reading this weekend. Finally INIGO goes back to cliff edge, starts to talk. It’s instant death if the MAN IN BLACK falls, but neither gives that possibility much credence. This is our two heroes meeting. They don’t know it yet; but that’s what it is. The last two sentences do two things; first, they tell the screenplay reader (who is usually going to be a producer or director or a hired reader initially, but me in this case) something important about this scene that the viewer will either not know at all, or may only be subconsciously aware of. Second, these words allow Goldman to draw me into the tale, creating anticipation, while making sure that I understand the spinal significance of this moment, which may not be fully clear this early in the story. These words are never spoken by the characters. In fact, both of these example passages are from descriptions of actions within scenes: words the viewer will never witness or hear. They’re only written for the benefit of the director, the producer, and others involved in the making of the movie. Goldman does that a lot, and with all his screenplays (of the nine I’ve read, anyway). Which makes the reading enjoyable, and even sort of makes the reader feel special … privileged. Like they’re in on something secret. Given his commercial success, I’d say this writing technique works; his movies are getting made because the executives with the power to greenlight them are enjoying the ride of reading his screenplays. You can read more of Goldman’s wise words to the writer in my writer quotations collection. You are currently browsing the archives for the Screenplay, screenwriting category.